This is a two and a half hour course introducing the prospective beekeeper to the hobby. All beesuits/veils will be supplied but please bring wellington boots and Marigold type gloves,wear thick trousers preferably not jeans. 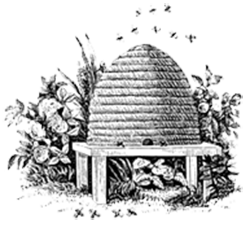 The course will outline the castes of the Honeybee The various hive types including the new Beehaus will be explained their pros and cons to be discussed. A Dartington Long Hive (Beehaus Predecessor) is on site as well as a Beehaus both with colonies of bees in. We also have traditional hives on site also with bees in them. Getting safely kitted up to inspect bees, beesuits their pros and cons will be discussed Smokers,their use, lighting and fuels will be demonstrated. We will be opening and inspecting colonies of bees in various hives to carry out an inspection, the queen, workers, honey,pollen and brood in all stages will be identified. Any questions will be answered as we go and after the colonies have been closed up. Further information sources will be given along with sources for Nuclei to get you started. (websites, forums and recommended reference books) Please note colonies will only be opened if warm and dry, at least one hive will have a glass coverboard so that bees can bee seen if it is too cold for full inspection. Course wll be weather permitting, so confirmation will be advised nearer the time. Practical Taster sessions have been put together for those with an interest in Honeybees and their life cycle, as well as those thinking of taking up the craft themselves. Bee suits will be provided at these sessions (please advise size when booking), we only ask that you bring Wellington boots and a pair of fresh Marigold type gloves. The sessions are half a day long and involve opening of hives to carrying out inspections and manipulations as colony size and time of season demands. You will have the opportunity to view the contents of a full sized hive. You will see the three castes of honeybees including the Queen. You will also be shown the stages, from egg to larvae, onto emerging worker bees as well as the all important pollen that the bees collect as well as the honey stores (their larder). In the session you will be able to handle the frames from the hives and ask as many questions as you want, and take as many photos as you like. We try and work on a one to one basis but can accommodate couples (there is only so much room around a beehive for all to see properly). We run hives made from traditional materials as well as modern higher tech materials. The sessions are very flexible to meet individuals requirements, whether you are just interested in finding out about honeybees or thinking of starting beekeeping yourself. 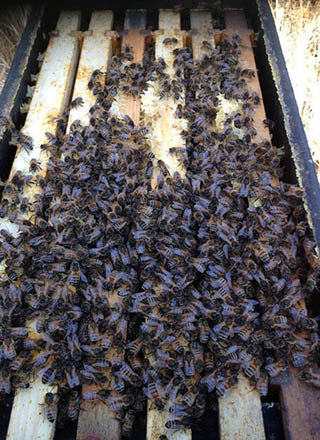 The taster session will last for half a day but bear in mind that hives are rarely opened earlier than 10.00 am as the temperature is too low (cold bees can be less than welcoming). At the sessions end participants receive a jar of honey collected by the bees from the very hives you have been inspecting. Dates will become available from early to mid April onwards. Session costs are £50.00 and will be booked at weekends only initially. Please email through the website for payment and booking details. 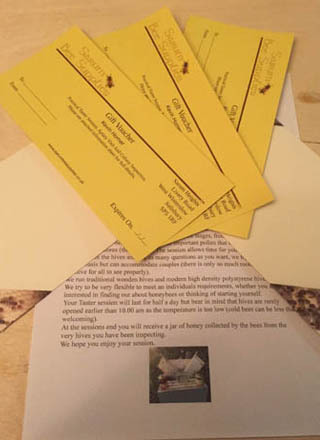 Beekeeping is weather dependant, therefore a confirmation e mail will be sent the day before to confirm or re arrange in the event of bad weather. Please advise us of any allergies or medical conditions if applicable.